George Plimpton, the famed participatory journalist, approached life with a patrician’s bearing and a marketer’s savvy. 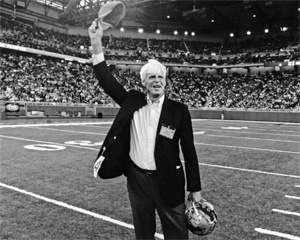 Plimpton’s best-selling book, Paper Lion, became a sports classic. Published in 1966, Paper Lion told the story of Plimpton’s experiences with the Detroit Lions during the team’s 1963 training camp. Plimpton pretended to be trying out for the less-than-glamorous position of third-string quarterback. He took his lumps, and the resultant book helped establish a long career as a magazine writer, book author and essayist. Some critics branded Plimpton, who died at the age of 76 in 2003, as a dilettante, and I suppose it’s true that he made himself famous by attaching himself — as a kind of literary barnacle — to other people, most of them more famous or more renowned in their pursuits than he. But Plimpton also could write, and he understood that there was a place for entertaining storytelling in the world of journalism. Want to write about the circus? Well, then, run away and join one, which he did at one point. Fair to say that Plimpton become his own major subject — and at a time when journalists were supposed to keep themselves out of the story. Directed by Tom Bean and Luke Poling, the documentary Plimpton! Starring George Plimpton as Himself chronicles the career of a writer who spent much of his adult life trying things on and letting the rest of us know how they felt: Among other endeavors, Plimpton attempted baseball, basketball, tennis, boxing and symphony conducting. The theory was that by attempting to do what others could do better, Plimpton (and by extension, his readers) would gain insights that were unavailable in other ways. We’d all become insiders. Plimpton also edited The Paris Review, a literary quarterly that published work by Philip Roth, William Styron and many others. He was a friend and campaigner for Bobby Kennedy, one of those people who seemed to know everyone. Sprinkled with a fair sample of Plimpton’s prose, Plimpton! pays fitting (and at times mildly critical) tribute to the writer and also offers us glimpses of the famous people with whom he associated. The documentary is, thus, not only a look at a writer’s life, but at the world he inhabited. As such, Plimpton! makes for an entertaining 89 minutes. I don’t know whether George Plimpton ever visited Muscle Shoals, Ala., but I’d bet that he would have liked to have traveled to this deep South recording mecca. 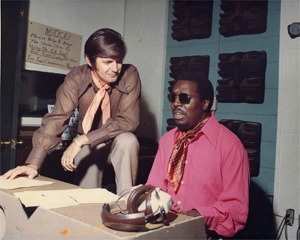 Muscle Shoals, a documentary by director Greg ‘Freddy’ Camalier, takes us to this small backwater where an unlikely impresario named Rick Hall began recording artists such as Percy Sledge and Aretha Franklin. Hall’s Fame Recording Studios became an R&B hit factory. Many of the studio’s artists — backed by a group of white musicians known as The Swampers — made R&B history. Hall later faced competition from The Swampers, who opened their own studio, Muscle Shoals Sound. Hall’s rags-to-riches story is fodder enough for any documentary, but Camalier — perhaps unwisely — tries to cover all of Muscle Shoals music. In his effort to review history and pay homage, Camalier includes interviews with artists as diverse as Mick Jagger, Keith Richards, Percy Sledge, Clarence Carter, Etta James, Alicia Keys and Bono, all of whom understand the legendary powers of the place. Beautifully shot — if overly long — Muscle Shoals makes a nice companion piece for 20 Feet From Stardom, a recent documentary about back-up singers. I got tired of Muscle Shoals before its 111 minutes had expired, but the documentary stands as a valuable look at an indispensable part of American popular culture.